RCMP documents filed in an Ottawa courthouse Wednesday reveal a level of skepticism the police have in the roles three Conservative senators played in the Mike Duffy expenses scandal. The documents, filed as part of the RCMP's criminal investigation, make it clear that lead investigator, Cpl. Greg Horton, does not fully believe information he has so far received from senators Marjory LeBreton, Carolyn Stewart Olsen and David Tkachuk. Through interviews with the three senators, as well as emails from various staffers in the Prime Minister's Office, the RCMP has attempted to piece together a picture of the role they may have had in the public relations game plan that was developed to explain why Senator Mike Duffy preemptively repaid his housing claims. The three senators told the police they had no prior knowledge of a personal cheque written by Nigel Wright, the prime minister's former chief of staff, to Duffy so he could repay his expense claims. Duffy had been claiming secondary expenses for living in his long-time residence in Ottawa, saying his primary residence was a winterized cottage on P.E.I. In April, Duffy said he had personally repaid $90,000 in housing and living expenses, although he said he didn't believe he'd done anything wrong. He told reporters he thought it was the "right thing to do" if there were doubts about his claims. He didn't reveal the source of the money he used to pay the expenses in question. The RCMP allege that Stewart Olsen and Tkachuk were instrumental in stick-handling the whitewash of a Senate internal report on Duffy's expenses after he had repaid the money. Stewart Olsen and Tkachuk were the Conservative majority on a powerful three-person Senate sub-committee in charge of how Duffy's report would be worded. Tkachuk was head of that committee. The third member was Liberal Senator George Furey. The committee, which met behind closed doors, ordered changes in the Duffy report so that paragraphs critical of him were removed. A statement that had said Senate expense regulations were clear and unambiguous, contradicting Duffy's assertion that the rules were confusing, was cut out. The RCMP have indicated there evidence the amendment to make these changes was moved by Stewart Olsen. However, Stewart Olsen told Cpl. Horton in a June interview that she didn't remember what changes were made. She told him she was unaware of any discussions between individuals where a deal would be made with Duffy to go easy on him in the Senate report if he paid the money he owed in housing expenses. Cpl. Horton is blunt and unequivocal in his opinion of Stewart Olsen's credibility. "I believe that Senator Stewart Olsen's version of events to police was incomplete and not consistent with the facts," he writes. He refers to a May 8 email showing Stewart Olsen was communicating with PMO staffer Patrick Rogers, saying she accepted PMO changes and took them forward. Rogers says in the email addressed to Wright, "I just met with CSO [Carolyn Stewart Olsen]. I gave her our changes. She agreed with them 100%." Later that day, Rogers emailed Stewart Olsen, saying, "Please tell me you were successful." She replied, "Only one more para we have to move a motion for...."
The RCMP alleges that whitewashing Duffy's report was part of a deal Duffy made with Wright and the Prime Minister's Office when he agreed to repay his expense claims using Wright's $90,000 gift. Tkachuk, in his July interview with Cpl. Horton, stated he didn't recall if PMO staff helped with the writing of the Duffy report, but said it was "possible." He said he received no direction from the PMO to make changes to the Senate report. The report was changed over two subsequent days, May 7 and 8, and although Tkachuk told Horton he didn't recall if he met with PMO staffers Rogers and Chris Woodcock about the changes, he said it was "possible"
When Horton asked Tkakchuk for copies of correspondence he had with Duffy or Duffy's lawyer, Horton said he "hesitated and said he would have to think about it." Horton concludes, "Ascertaining Senator Tkachuk's complete involvement is difficult to determine because he said he does not recall many of the specific details about conversations and briefings." Speaking to reporters Wednesday in the Senate foyer, Tkachuk said, "I don't understand what all the fuss is about. The fact that there was communication with the PMO or discussion on political matters. That's normal." Cpl. Horton interviewed LeBreton, who was the government Senate leader at the time of the deal. He also listened closely to an address she gave to the Senate Oct. 23 in rebuttal to an explosive speech Duffy had delivered in the chamber the day before. In her speech, LeBreton told members of the Senate that Duffy's assertion she agreed he not be audited by Deloitte was false. "In fact, I wholeheartedly supported the calling in of an independent auditor..." she said. But, Horton noted, although LeBreton may have supported the decision to refer Duffy to Deloitte, he has emails showing she also agreed the audit of Duffy should be halted if he repaid, once she was requested by the PMO to take this stance. In her interview with him, she told Horton there was no suggestion by the PMO that Duffy should be excluded from the Deloitte audit. LeBreton told reporters Wednesday in the Senate foyer, "I'm sorry if they don't believe ... I answered all their questions honestly and I conducted myself properly throughout the whole process." 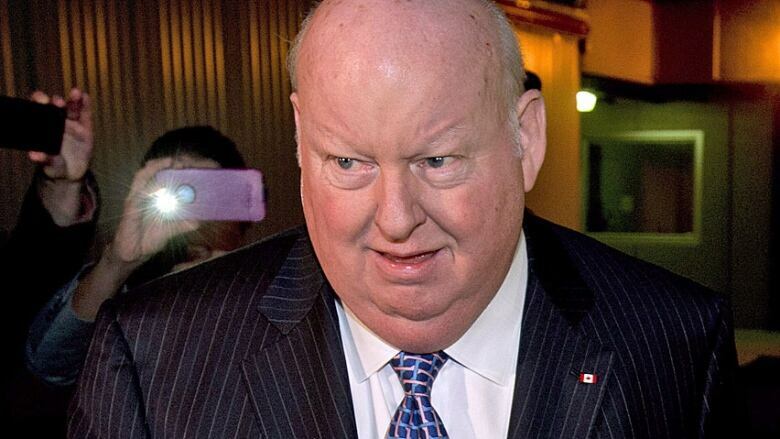 In the end, Deloitte, an independent accounting firm, did conduct a forensic audit of Duffy expenses, finding that he spent only 30 per cent of his time in P.E.I., the place he declared was his primary residence. In his ITO, or information to obtain production orders, for the emails filed with the Ontario court, Horton explains the emails he has already obtained were provided to him by Wright and the PMO. Horton says the only emails he has regarding how LeBreton, Stewart Olsen and Tkachuk communicated about the investigation into Duffy's expenses are either from PMO staff, or have been forwarded by PMO staff. What he needs, he says, are all emails and attachments for the Senate-issued accounts belonging to LeBreton, Stewart Olsen, Tkachuk and Duffy for a three-month period. However, rather than asking for co-operation from the senators themselves, Horton is asking for the data to be retrieved from the Senate server, "under the supervision and assistance of RCMP forensic technicians."